Color Outside the Lines: Designer Do-Over Version 3? As you all know, I follow Mark D. Sikes and his work probably a little too closely. (Cue the silent judgement and side eye.) But I won't make apologies for it, as I find his work wholly inspiring. Mark let his Instagram followers know yesterday that Rizzoli will be publishing a second book for him soon, but no news as to when exactly the book will hit the shelves or what it will be titled. It's really no surprise that they were so quick to jump to signing him on for another book. Mark's website lists 14 unpublished projects, not including the recent Coastal Living Idea House Mark did in Newport, Rhode Island. 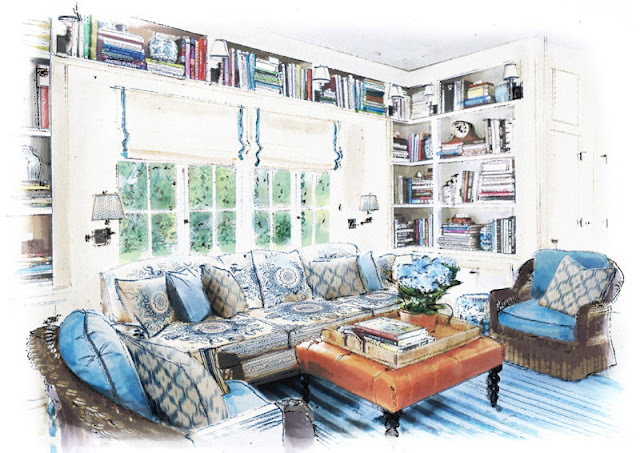 His first book, Beautiful: All American Decorating and Timeless Style is now in it's 4th printing with Rizzoli since it was released in 2016. You can read the review that I did of the book, here. Mark purposely designed the book to be printed in small format, so that it would be at the top of the stack, a term he even hashtagged for his Instagram feed. I really hope that the next book will be a larger book, but - we will have to wait to see. 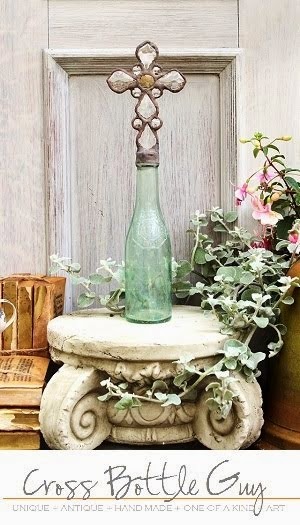 We will also have to wait to see what he has in store for the redecoration of his own home! That's right, Mark is redecorating. He leaked a day ago that he was starting to do some redecoration of his own house, and that the mood boards he had created for Schumacher (the high-end fabric line that carries Mark's licensed fabrics) were serving as inspiration. 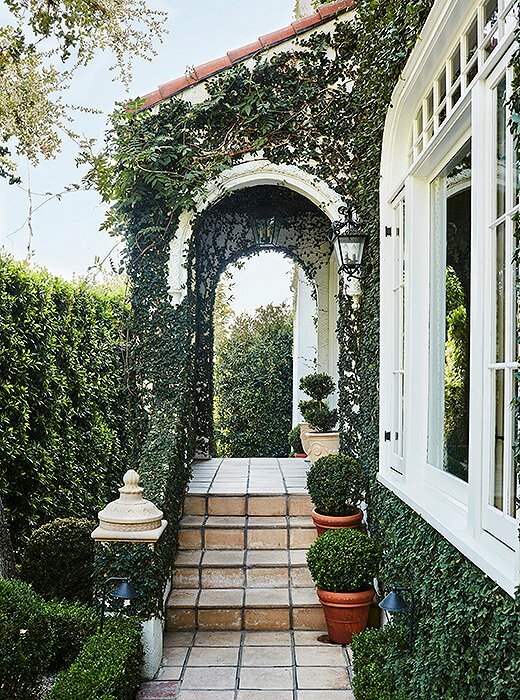 When Mark and his partner Michael bought their Hollywood Hills home, it was far from the beautiful house we've all seen on the pages of Veranda and House Beautiful, and on sites like One Kings Lane and Lonny. No, it was in fact, very different. I thought that it'd be fun to take a trip down memory lane with Mark's changes over the years, including the amazing renovation that they did on the property after buying it in 2010. BEFORE: Before Mark moved into the house, it was actually painted a sort of blah beige. 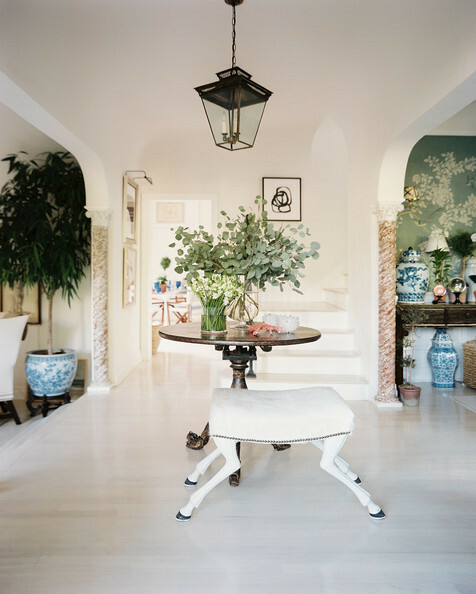 AFTER: From Lonny Magazine, you can see that Mark added a few architectural changes, including the column to the left and beautiful terracotta embellishment. 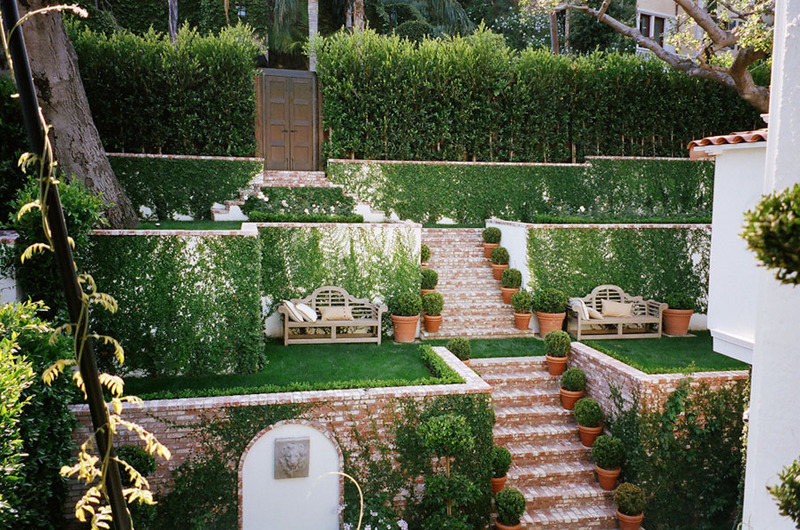 The gardens were completely changed, and that unruly tree beautifully manicured. Mark painted the house white, a lovely juxtaposition for the Spanish tile roof, and has allowed the ivy to grow onto the stucco here, and in the back garden. The front door was painted a high gloss black, and the lighting was changed. AFTER: Most recently, One Kings Lane did a feature on Mark. 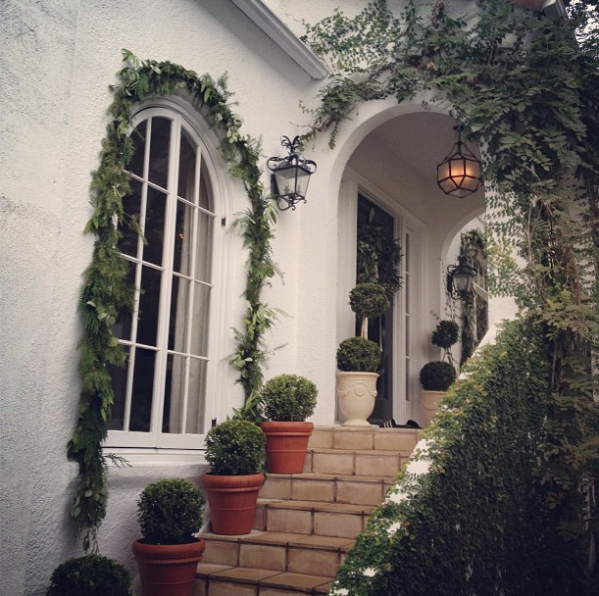 The ivy has grown onto most of the surrounding stucco. So beautiful. AFTER: A view at Christmas from the other side of the entry porch. 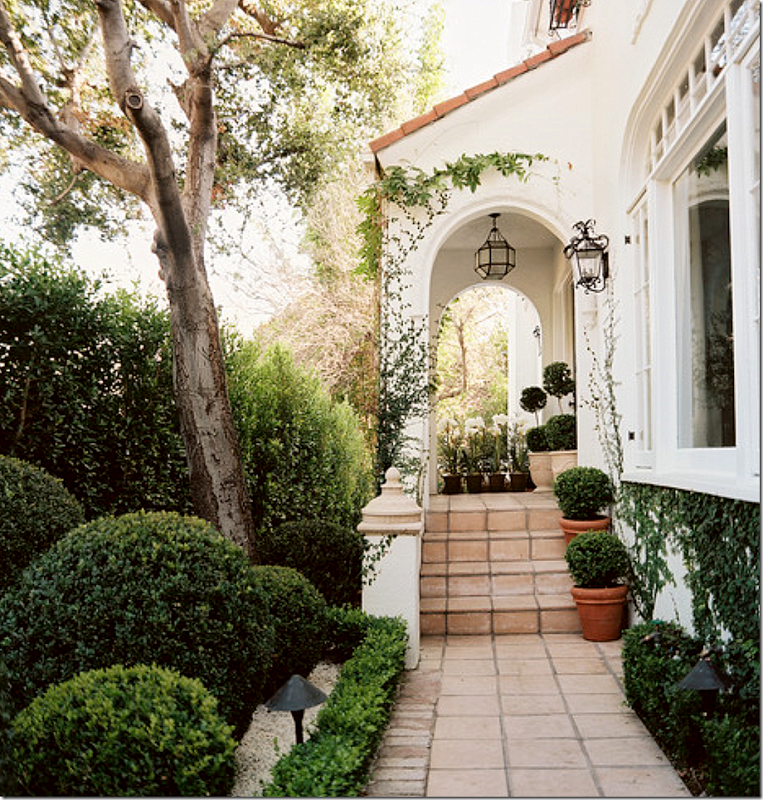 AFTER: And another view from the opposite side of the entry porch, showing the tree and new manicured ficus hedge that Mark lined the property with. BEFORE: The old gate, and entry view to the house. 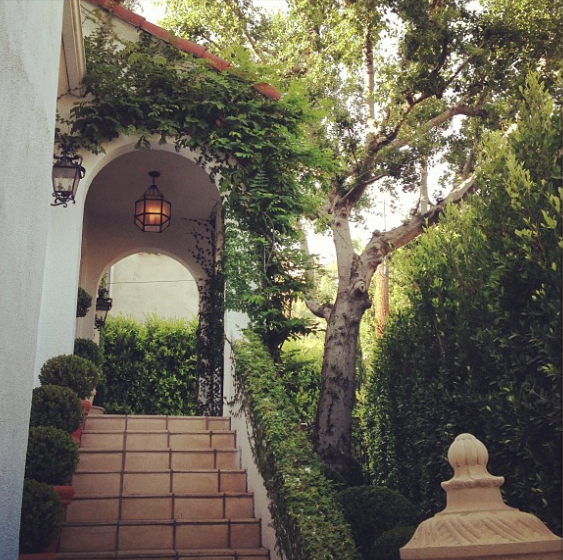 AFTER: The stucco garden wall was created, as well as the column for the new iron gate. Isn't this so much better? AFTER: Mark turned the garage into his home design studio. 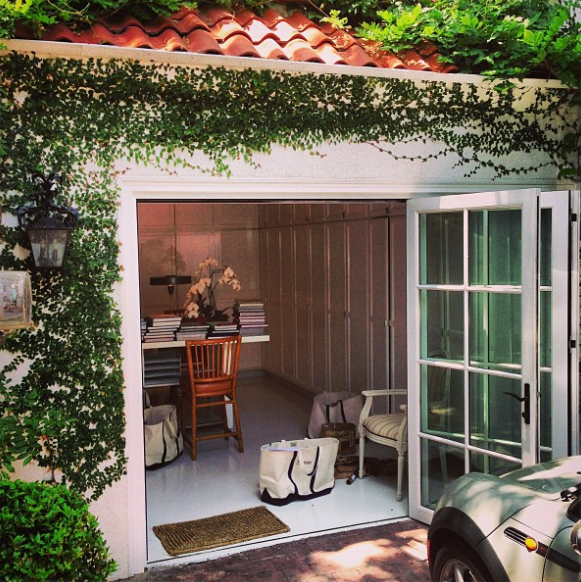 AFTER: Hard to believe this was once a garage! 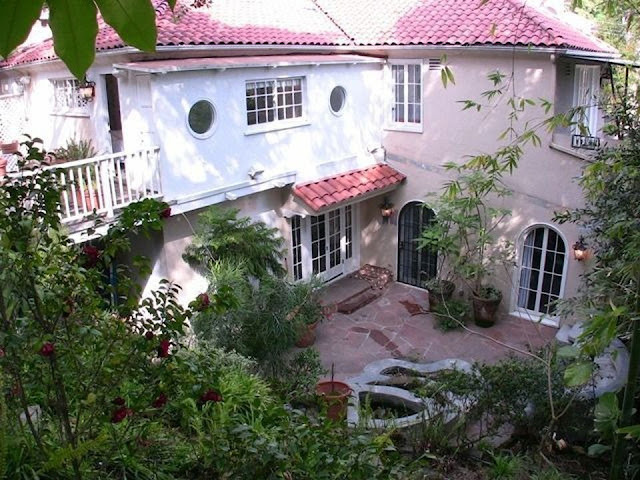 BEFORE: Architecturally, the house had lovely bones. 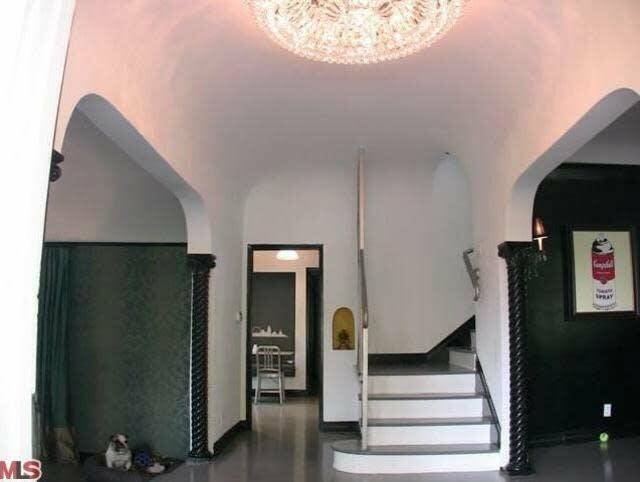 The spiral columns at the side of each of the arched entries to the living and dining room, in particular. AFTER: Before the photos for House Beautiful were taken, there were these test shots. You can see the massive changes starting here, and they flow throughout the rest of the house. 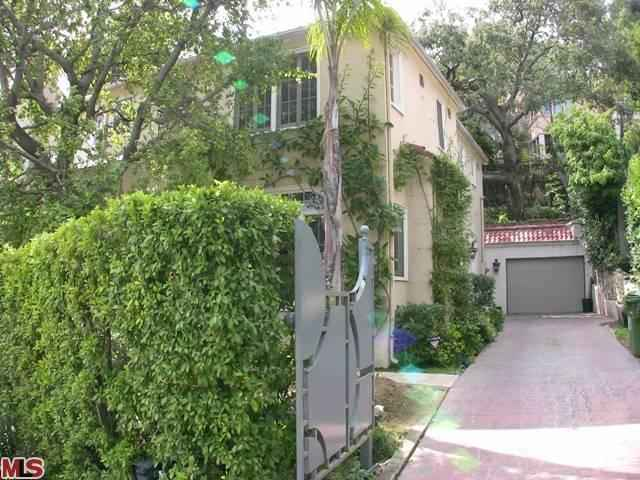 AFTER (v.1): As featured in Lonny, you can start to see the amazing changes that Mark and Michael did to the house. 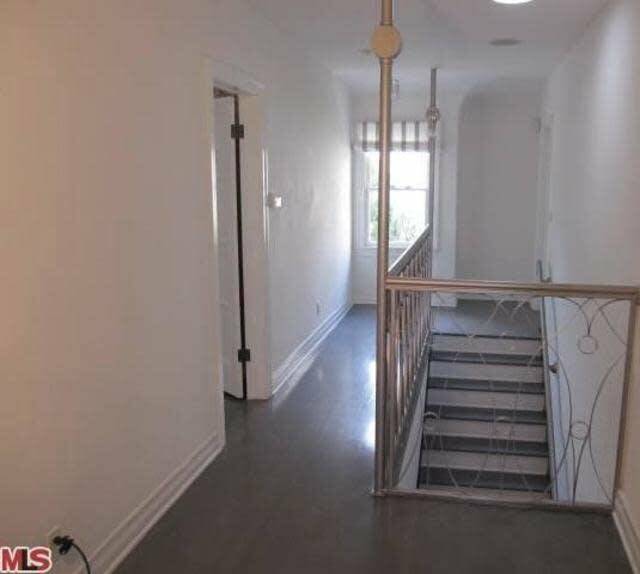 Gone are the gray floors, and the dark wall colors, dated railings and black mouldings. 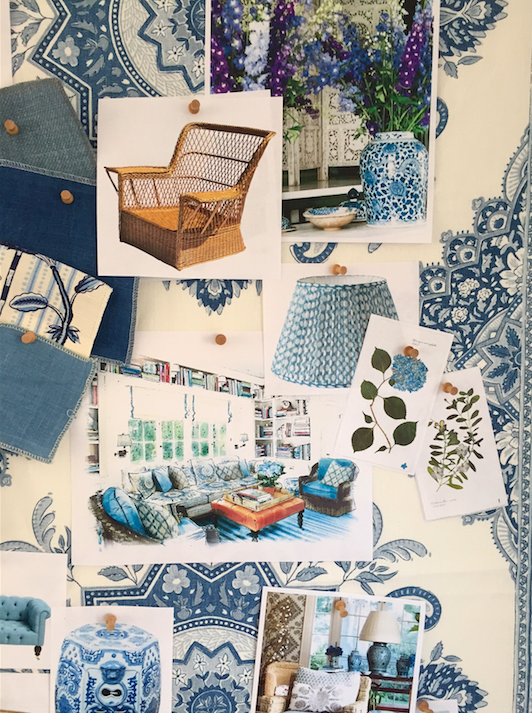 In are what we've come to know as staples for Mark: chinoiserie wallpapers, blue and white, and style on top of style on top of style. The old crystal fixture was replaced by a lantern. AFTER (v.1) Here, from the House Beautiful feature, you can see the railing Mark replaced that old silver railing with, and the beautiful new paint treatment done to make those beautiful spiral columns look so gorgeous. AFTER (v.2) Here, from the Veranda shoot, you can see that not much really changed in the foyer. 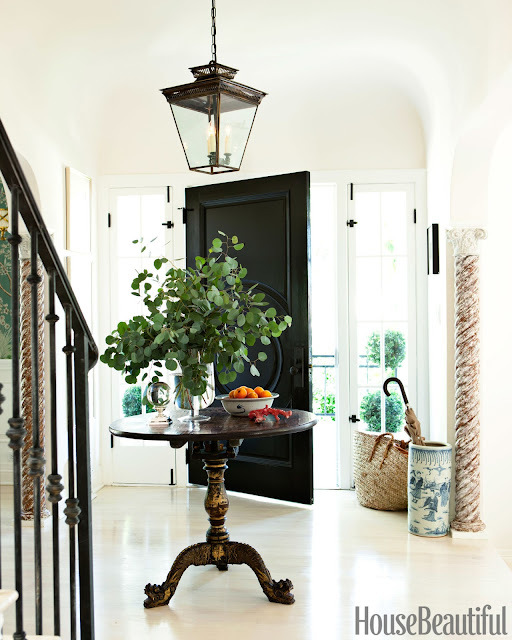 The lantern was replaced by this onyx orb fixture, and the entry table had a bit of a restyle. Moving into the dining room now, there have been some shocking changes. Not only pre-Mark, but post Mark. BEFORE: Again, all black wood work here, and black walls. The decorator for the house considered it to be art deco in style. AFTER: (v.1) This was everyone's favorite dining room in 2012. 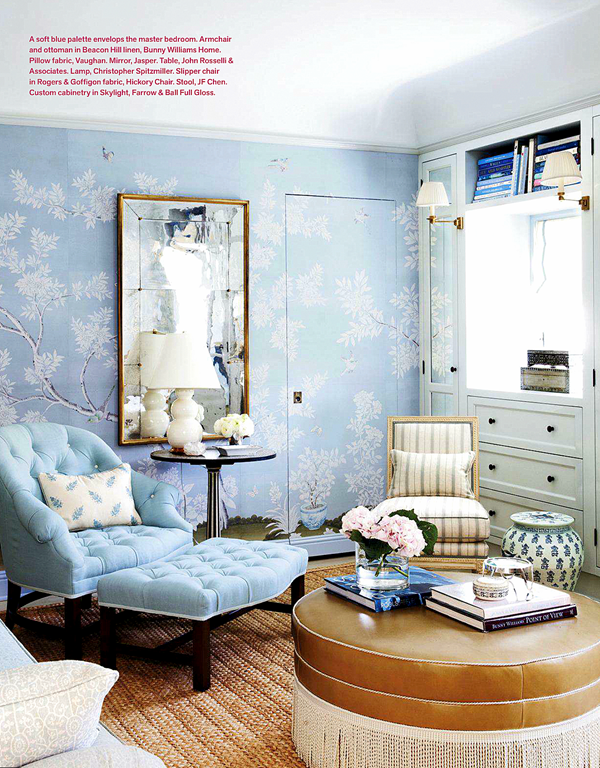 That wallpaper sparked a slew of DIY Chinoiserie wallpaper blogs and pinterest boards. AFTER: (v.2) Gone is the wallpaper. 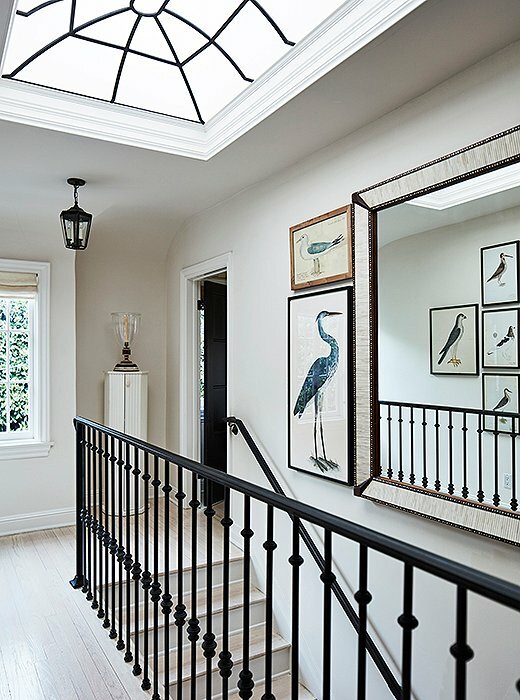 In it's place, beautiful antiqued mirror panels. This sparked a lot of debate and controversy. People loved Mark's wallpapered dining room, so much so that they were willing to voice a pretty loud opinion about how saddened they were by this redo. But I love it! 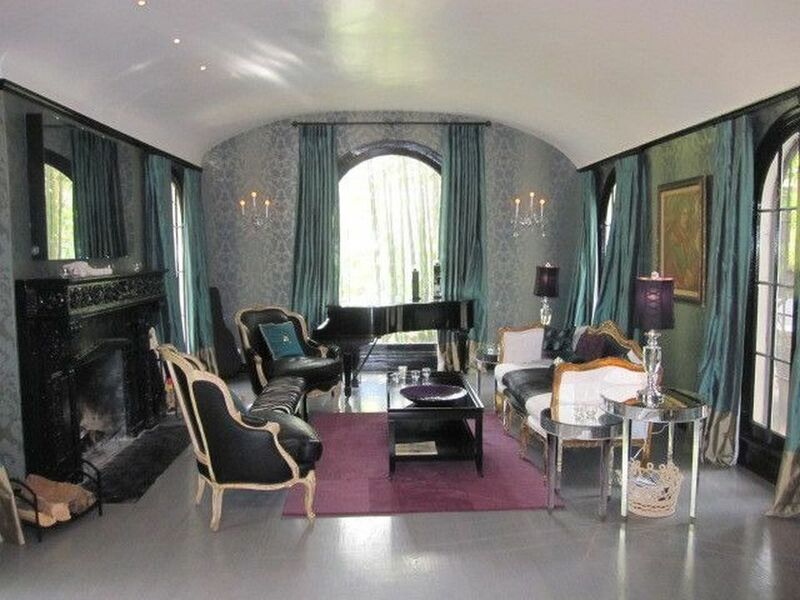 Apart from the mirrors, the settee left the niche, and was replaced by a marble topped rococo table. 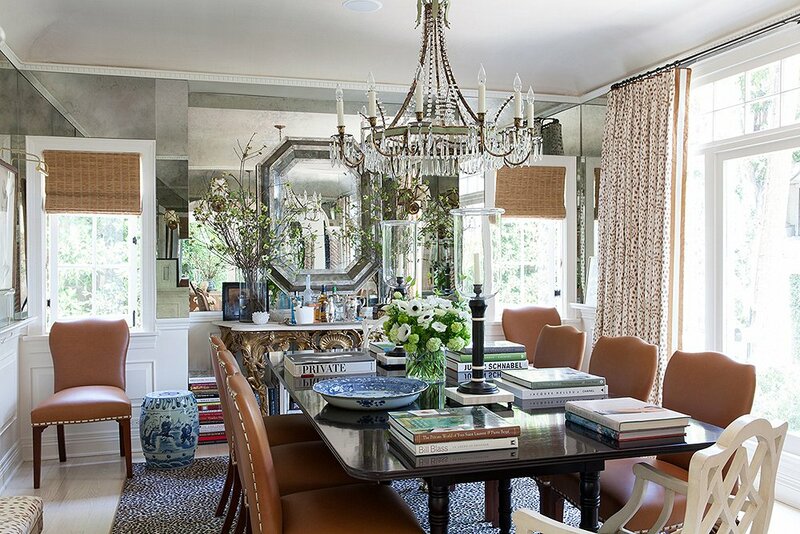 The chandelier was changed, and the chairs were reupholstered in a beautifully rich caramel colored leather. 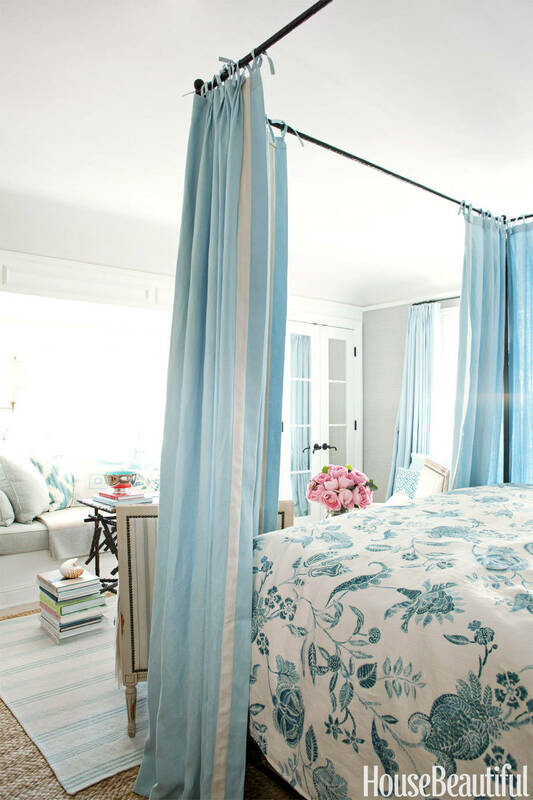 The once all white curtains were switched out for the beautiful Les Touches by Brunschwig & Fils. 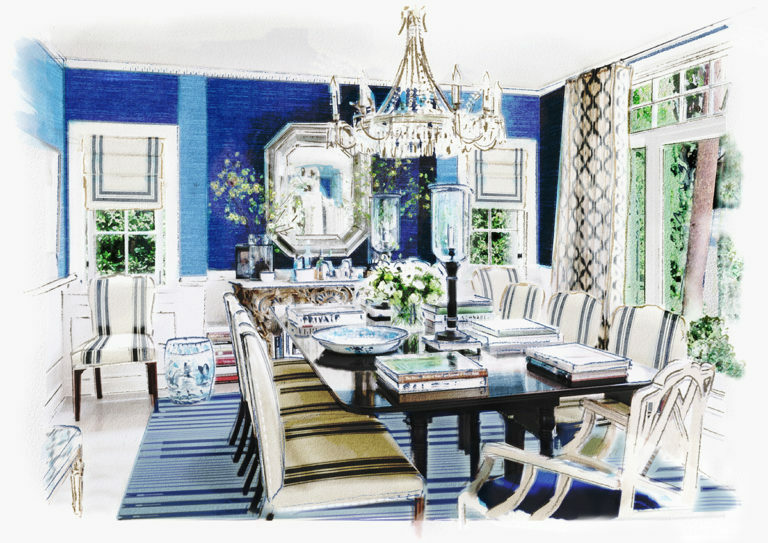 There are a few things here that are quite lovely, including what might be a glimpse of what could replace those mirrors: navy blue grasscloth. BEFORE: The living room. Wow. Just, wow. The walls here were wallpapered, something that Mark quickly removed in favor of the white walls he's kept all along. More black woodwork, and heavy drapery. AFTER: (v.1) As it was featured in House Beautiful in 2012, the room is stunning. 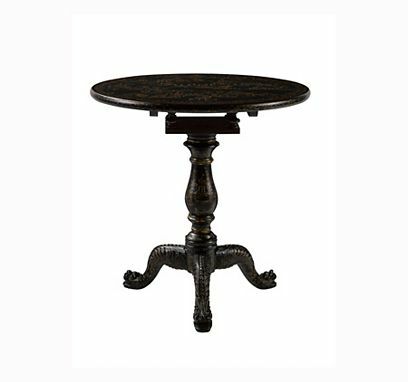 Filled with beautiful, sophisticated furnishings. You can tell that Mark had incredible vision for what this space would be considering what he first saw. AFTER: (v.2) From the book, The fireplace detail sings in this new finish and the architecture of those windows and french doors are glorious without the curtains. 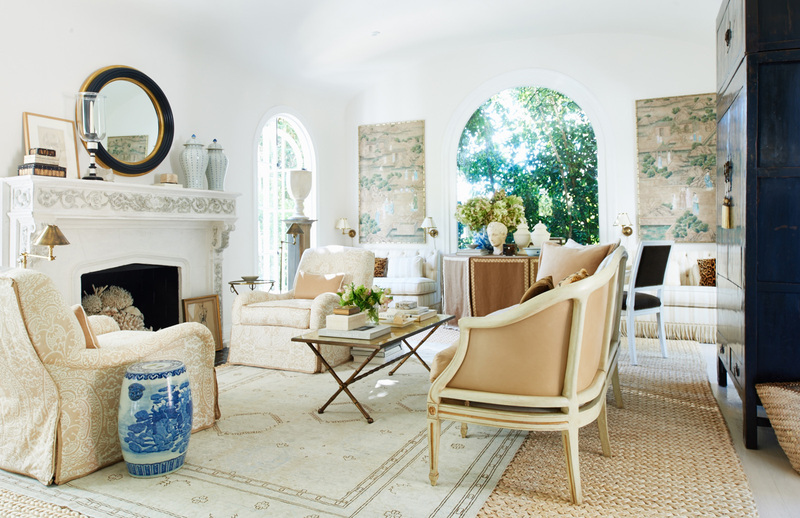 Again, I loved the changes with this room, including moving the settee that had once been in the dining room to the living room, and those wonderful English roll arm chairs covered in Quadrille Veneto. 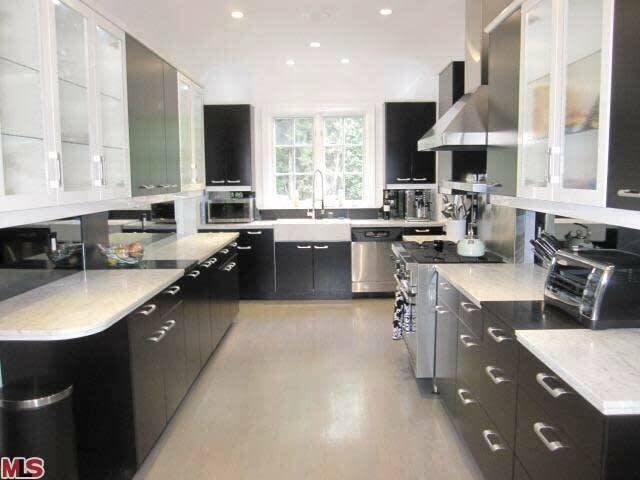 BEFORE: The kitchen, and you guessed it - more black. I'm not exactly sure what was behind the cabinets to the left, perhaps a maids room? It was obliterated in favor of the new kitchen and family room. AFTER: (v.1) Once the wall was down, Mark and Michael did an island in the kitchen to bridge the family room and kitchen together. Here, a small portion of the library surrounds the seating group, and a small television provides some entertainment. But really, when does Mark have time to watch tv? AFTER: (v.1) to the left of the kitchen is a small eating area with directors chairs surrounding a tulip table. 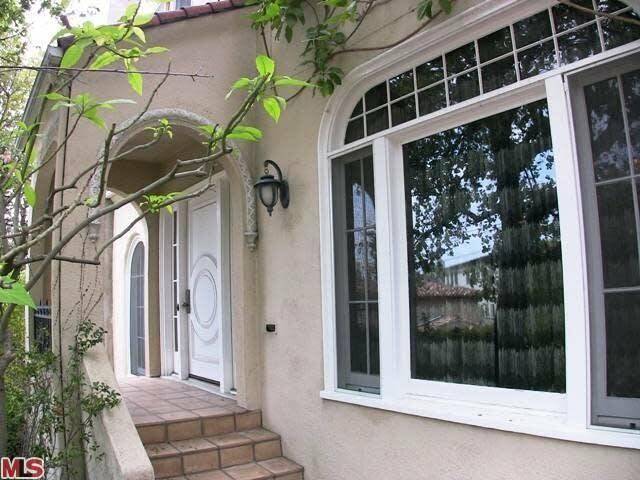 You can see a renovated bathroom with blue and white tile beyond, the 1/2 bath for the ground floor. AFTER (v.2) Mark still has the same beautiful cabinetry, but a few changes were made. 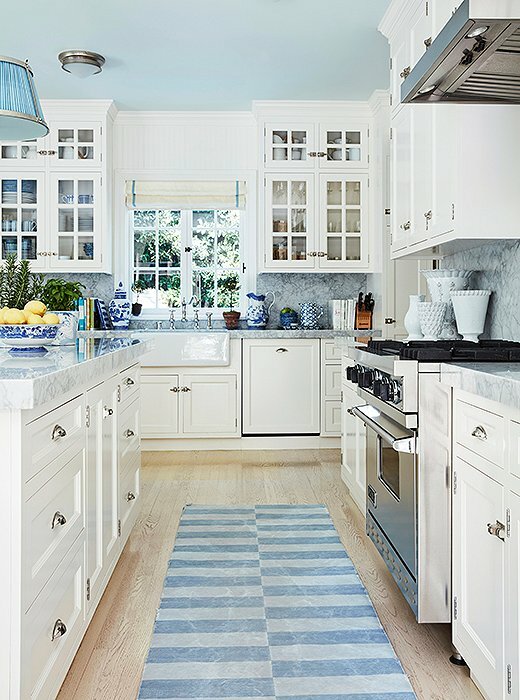 Including new blue dhurrie rugs, new pendants over the island, and a soft blue paint added to the ceiling. AFTER (v.2) And looking back over to the seating group, the directors chairs were switched out in favor of these wicker chairs, with blue and white stripe cushions, and new curtains in a lovely garden green with blue accents. The barstools also were changed. AFTER (v.2) Big changes in color here. The sofa was replaced by this English Roll arm, covered in a beautiful garden ivy print fabric. The chair cushions changed for a grass green with blue piping, and a new dhurrie. INSPIRATION: More of his beautiful fabric for Schumacher, including a big change to the sofa, with his Montecito Medallion taking center stage. 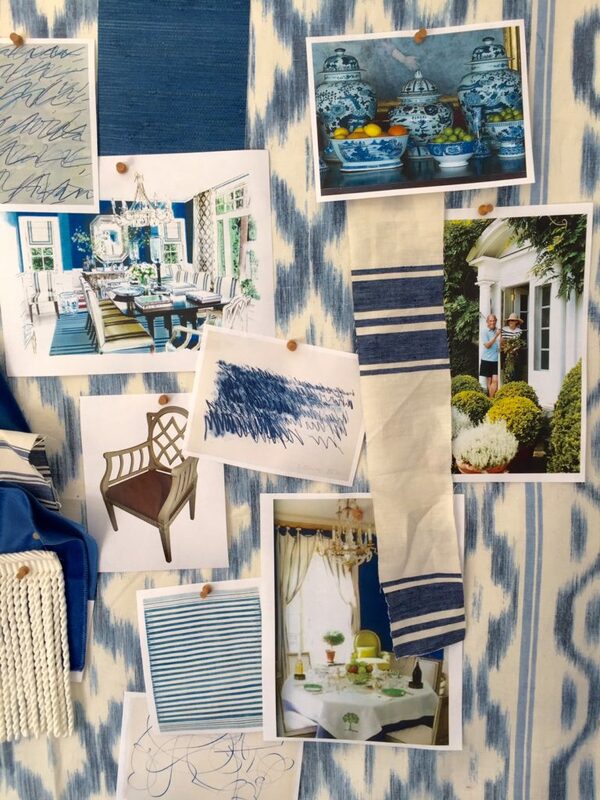 INSPIRATION: Mark created this mood board for the space. 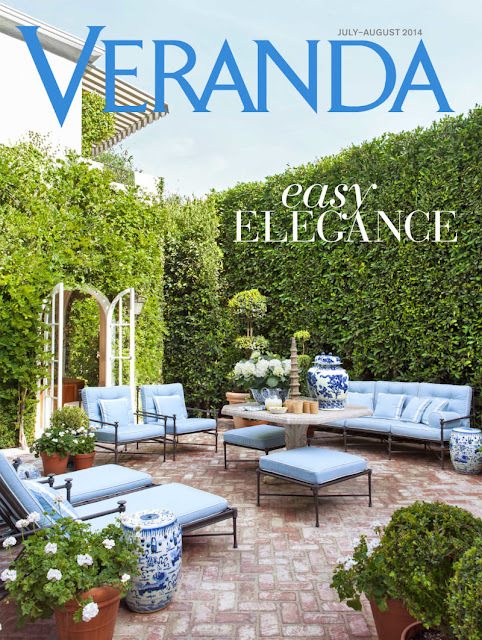 I'm guessing we will still see wicker in this space, and of course, lots of blue and white porcelain. BEFORE: Yeah. A little hard to believe, right? 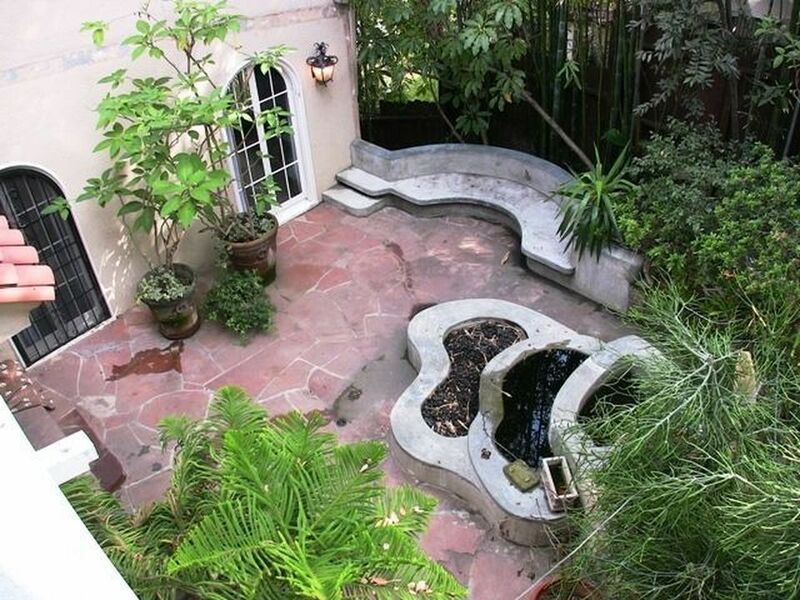 Not only is the man a visionary when it comes to interiors, but what he did with this garden space is down right, unbelievable. AFTER: (v.1) Windows were added to the second floor guest room to create symmetry and allow more light into the space, along with another set of french doors in the kitchen area once the wall came down between the maid's room and the old kitchen. The entire patio was repaved in antique brick, and the gardens completely redone. AFTER (v.2) Featured in Veranda, not a lot changes here. 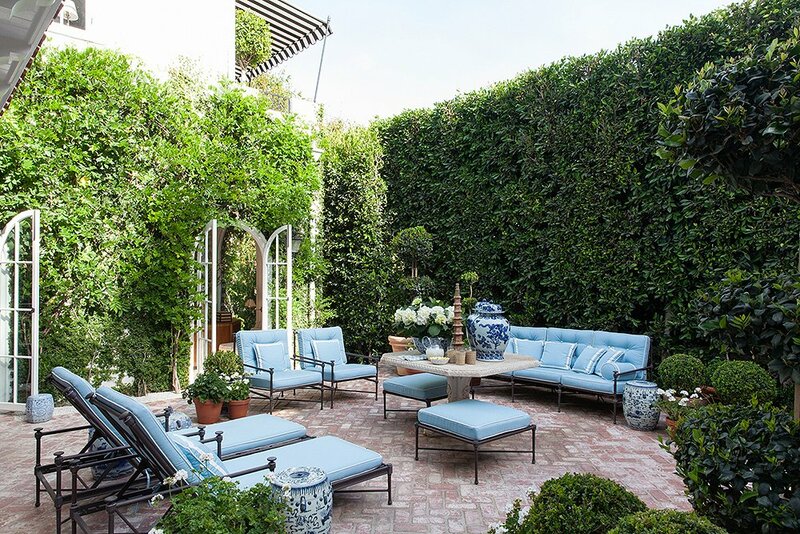 The ivy is a little more manicured, but for the most part the space doesn't change. Let's get back to the pictures of the space as it was when Mark and Michael purchased the property. 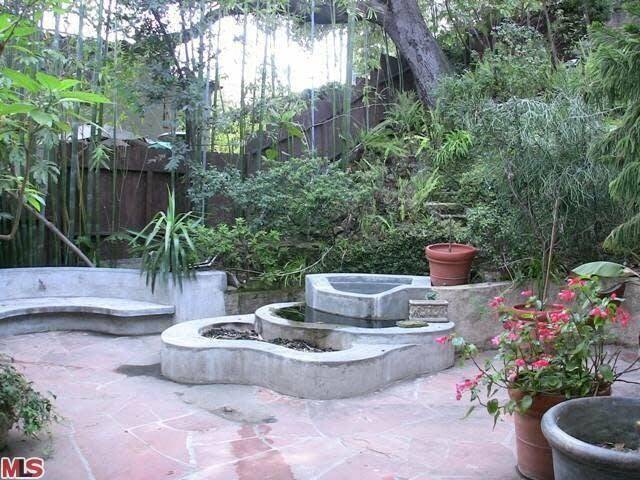 BEFORE: A concrete multi-tiered pond and a concrete bench provided seating in the old space. Bamboo lined a privacy fence that followed the hill and partitioned the space from the street. The task of keeping up this garden was clearly too much for the old owner. AFTER: (v.1) I am calling this v.1 because the curtains are still in the living room, but there really are no significant changes in this space, and my guess is that there never will be. 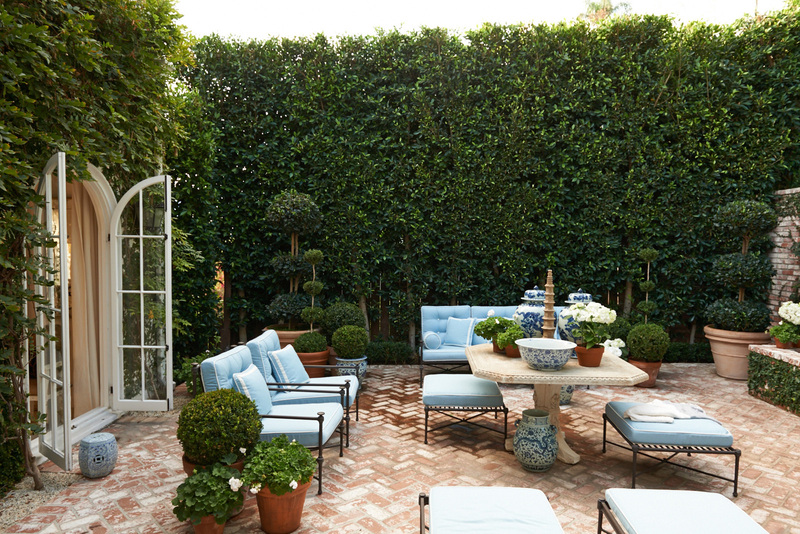 Mark abolished the concrete structures making for this beautiful brick patio, and lined the fence with manicured ficus which provides absolute privacy. BEFORE: Looking down into all of that unkempt space. It's sad that such a beautiful house had such pitiful care. AFTER: Stunning. 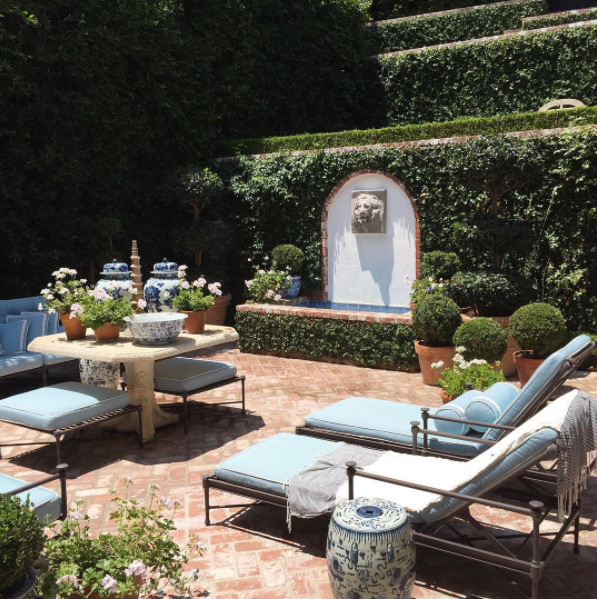 As featured in the One Kings Lane tour, the garden is a showstopper as always, especially when you consider it's less than humble beginnings. 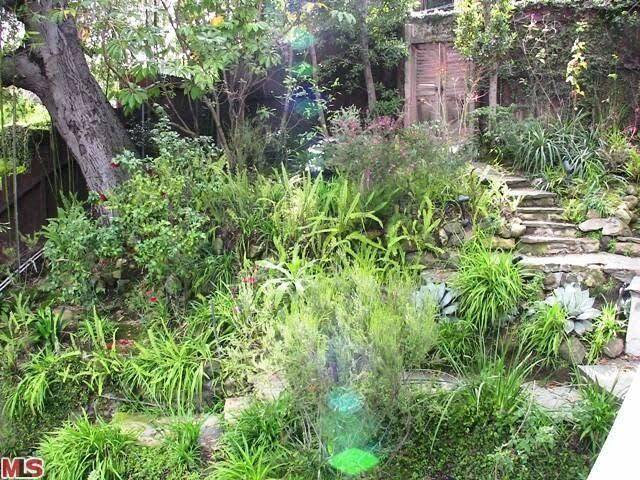 AFTER: Heaven in the Hollywood Hills. Remarkable really. Absolutely breathtaking. AFTER: Mark did keep a fountain on the patio. A small one, lined in beautiful blue tiles, and fed by the mouth of a concrete lion. He says you can hear the fountain throughout the house. Back inside, and moving upstairs. BEFORE: The upper staircase, some what sparse, with stripper poles for railings. I'm not sure what they were thinking when they installed this. Thankfully Mark swooped in and saved the day. AFTER: (v.1) That gorgeous skylight. I mean, WOW! An absolutely perfect addition to the space. There's really not much that changes in this space. The real changes happen in the bedrooms. BEFORE: A blank canvas, finally. I'm sure after tackling all of the black wood work in the house, and that kitchen redo it was nice to start over somewhat fresh upstairs, (at least here). AFTER: (v.1) WOW. Again, right!? Maybe after painting over all the black, Mark had a change of heart. (KIDDING!) This room was incredibly inspiring to me. So much so, that I actually painted my bedroom black. It was actually a favorite bedroom for a lot of people. AFTER: (v.2) And I don't know how many times I've said this already, but WOW! Just WOW! 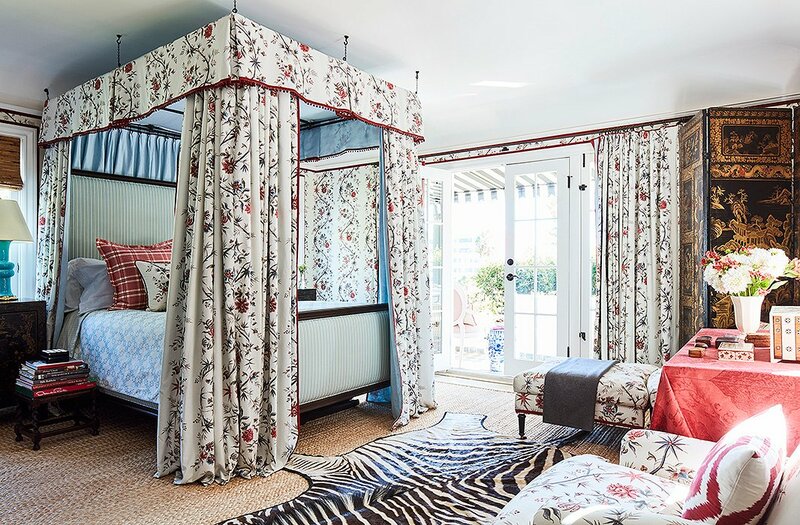 The entire room was covered in this gorgeous Braquenie fabric inspired by Givenchy's country house. I'm not sure if this one is on the list to change, but there are no pre-planned inspiration boards about it. BEFORE: What is now the master bedroom of the house, had an unusual layout before Mark, and a lot of pink wallpaper. AFTER: (v.1) Mark reoriented the room by changing the position of the bed, and creating french doors to a Juliette balcony off of the master bedroom. The walls were painted a soft gray. 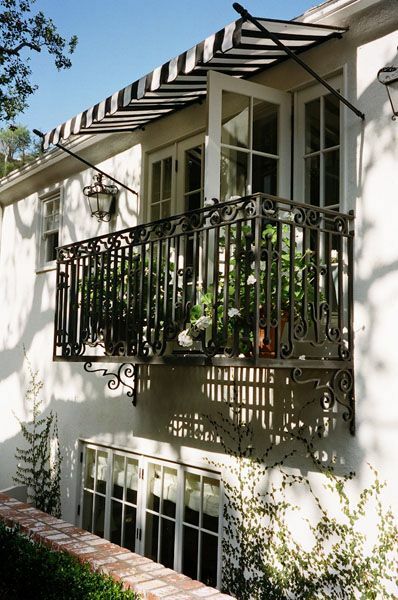 AFTER: (v.1) The custom iron Juliette balcony that replaced the once crumbling wood deck. AFTER: (v.1) The window seat that was original to the master suite stayed, flanked by two closets with mirrored french doors. During the second redecoration, Mark and Michael decided to expand the master bedroom to create additional space in the seating area. AFTER: (v.2) And you can see that it really did expand the footprint of their room. 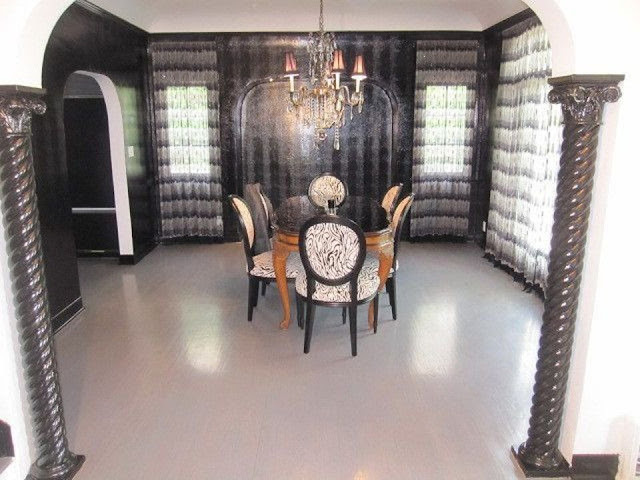 They also papered the room with Gracie wallpaper and changed the linens. 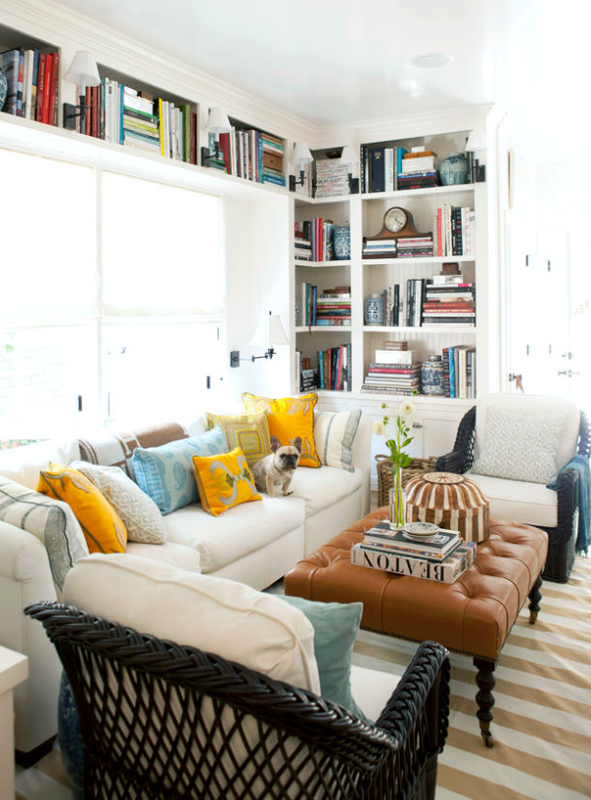 The two chairs were replaced in favor of this small settee. AFTER: (v.2) The closets were removed and windows were placed over built in dressers, and mirrored armoires. 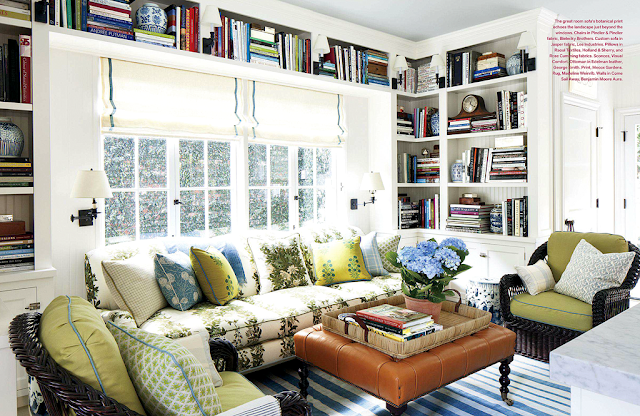 Unfortunately, there were no other before photos of the house, including of the next room - Mark's library. BEFORE: (sort of) Prior to the walls being covered in the Peter Dunham fabric we saw when the room was featured in house beautiful, they were papered or upholstered (not sure which) in a pale blue/gray stripe. AFTER: (v.1) The room finished, with Peter Dunham fabric, as we saw the room when first featured with House Beautiful. Gorgeous. 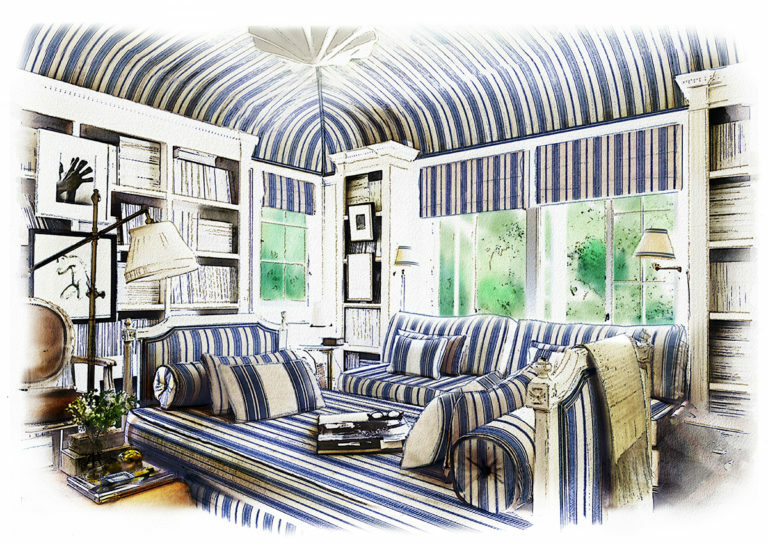 AFTER: (v.2) Now the room is completely tented in a Carolina Irving stripe, with the daybed in the center of the room, and a beautiful banquette under the window. 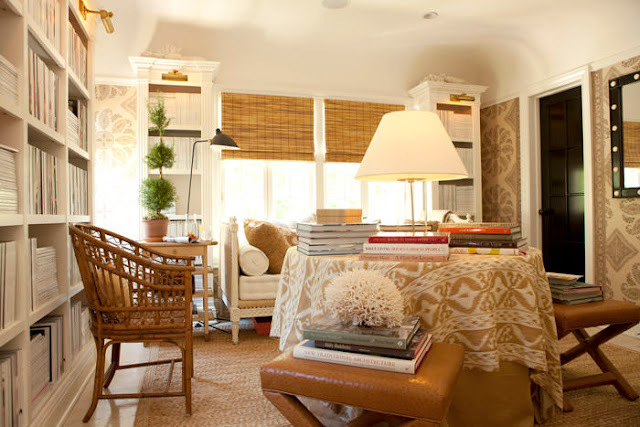 Mark added sconces to the bookcases on either side of the window, and hung art from the shelves for added interest. 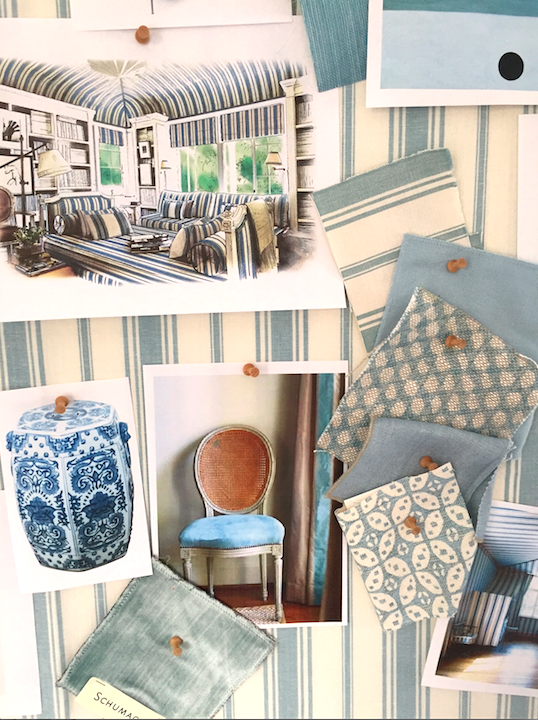 INSPIRATION: All of the Carolina Irving fabric is switched for blue and white stripes. Still a gorgeous space. INSPIRATION: Another board that Mark put together for the space. It will be interesting to see where he goes with this. So there you go, are you as big of a fan of Mark as I am now? 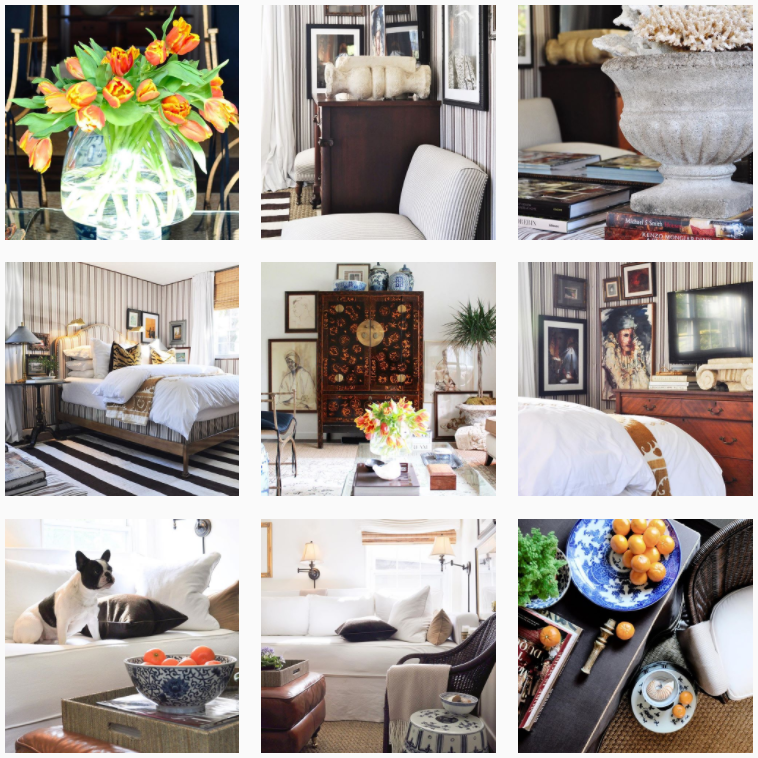 Are you as excited to see what round 3 of decorating in his beautiful home will look like? We will all have to wait, but I'm sure if you follow along on instagram you'll see some sneak peeks before it hits the book! Check him out here. 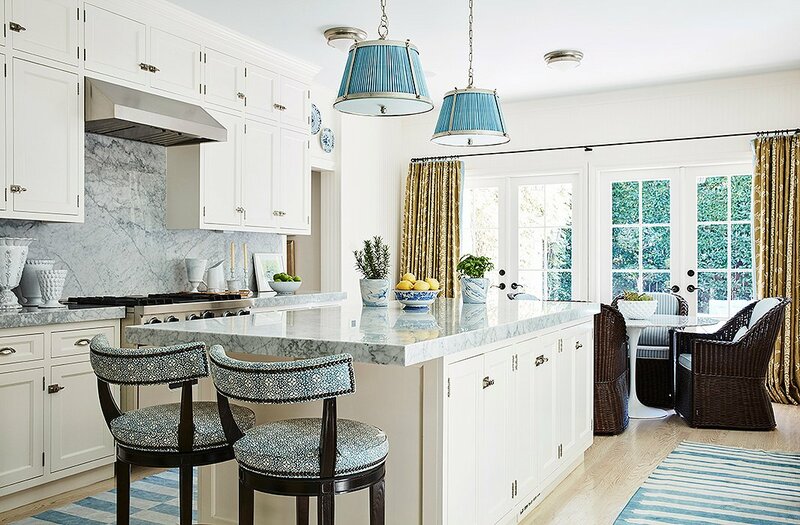 Also, thanks to my friend and fellow blogger, Joni Webb of Cote de Texas who did a similar story about the second renovation in 2014 here. I'll be back soon with my finished bedroom, some news about the guest room redo (a room you've never seen) and the end of a decade of art. Love the update on Mark. He is so talented! Thanks for a great post! I love Mark, too. Have met Peter Dunham and Carolina Irving many years ago- when I worked for and with the late Tice Alexander, a Parish-Hadley trained decorator who had fabulous taste, similar to Marks! His transformations are awe inspiring. Beautifully done and you've given it justice with this post. fabulous!!! i'm confused though - is he doing that new decor???? I hope so!!! or is it just a what if? confused! great story!